A brand new online mode introduced in Pokémon Sun & Moon is the special Battle Royal mode. 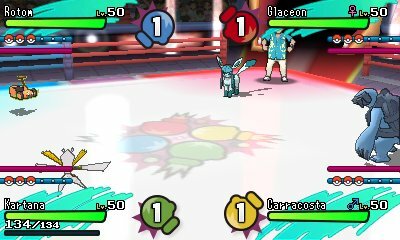 This mode is a 4 player mode where each player sends in one of three Pokémon they bring to battle. In it, they can target down any of the other Pokémon on the field. 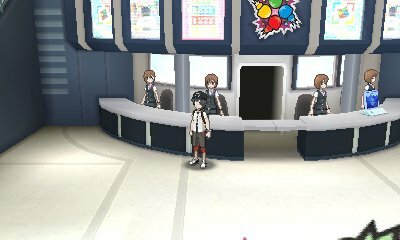 The mode can be played in a special facility in single player, or over multiplayer using the Festival Plaza communication modes. The rules for the mode are simple. You go in with 3 Pokémon, and as soon as one player has lost each of their Pokémon, then the battle is over. To determine the winner, the results are tallied up based on how many Pokémon each player managed to take out, as well as how many Pokémon they have remaining. Once that has been tallied, the winner is titled. The points a Pokémon has gained is then put against the amount of Pokémon each player has remaining and the winner with the highest amount of points wins. So, even if you defeated the most Pokémon, there's a chance you'd lose due to the amount of Pokémon you lost. 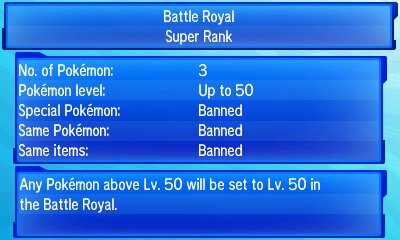 The rules to this are the same as the Battle Tree where you can't use Special Pokémon, Same Pokémon or two Pokémon with the same items. When you participate, you will get given BP regardless of if you win or lose, but a higher amount if you win. 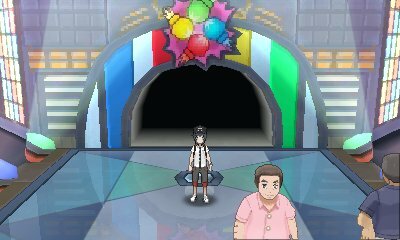 If you defeat the Master Rank, the Pokémon you use will be given the Battle Royal Master Ribbon. There are 51 different trainers to face. The Battle Royal mode gives you Battle Points as you play through, you will need to spend them somewhere. Battle Royal has got three clerks who will sell you items in exchange for your BP. These are all vital battle items and can only be purchased here.